Most parents, including me, enroll their kids in piano, guitar, voice, dance and acting lessons. Here's a new lesson, a magic trick, you may want your kid to learn, “INSPIRE MAGIC” MAGIC WORKSHOP FOR KIDS” with the TRICKMASTER JB DELA CRUZ. Three days (October 9, 15 and 16, 2011) of fun, magic and learning that comes with a complete set of MAGIC KIT , Workshop Certificates, FREE SNACKS for students for a minimal fee of P5,000. 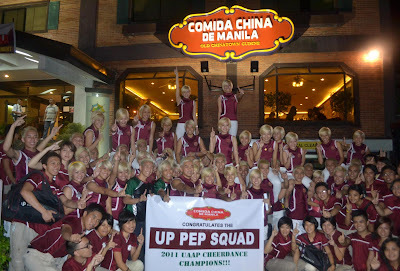 Fresh from their triple victory in the recently held 2011 Samsung UAAP Cheerdance Competition, the UP Pep arrived 100-strong at Comida China de Manila, formerly known as Panciteria San Jacinto-Pasig and the metro’s favourite blow-out and celebration place. Comida China, (owned by the Torres Family who also run Mom and Tina Bakery Cafe and the Red Rickshaw in San Fernando, Pampanga), pulled off all the stops in paying tribute to the back-to-back champs. Comida owners believe “such a significant achievement deserves to be celebrated with a full-course Chinese lauriat”. 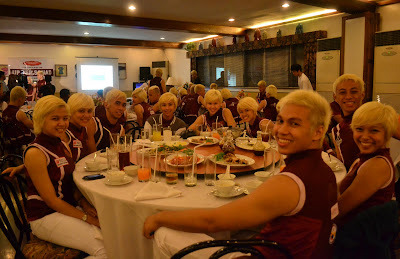 Still sporting their sensational platinum blonde hair and peppy attitude, the group was accompanied at the dinner by UP College of Human Kinetics Dean Leilani Gonzalo, former Vice Chancellor for Community Affairs Grace Gregorio, head coach Lalaine (Coach Lala) Pereña and assistant coaches NJ Antonio and Pio Niño Opinaldo. The UP Pep won first place in the prestigious Samsung Cheerdance Competition on September 17 in back-to-back fashion, now bringing their title total to 7, just one crown away from the University of Santo Tomas with 8. 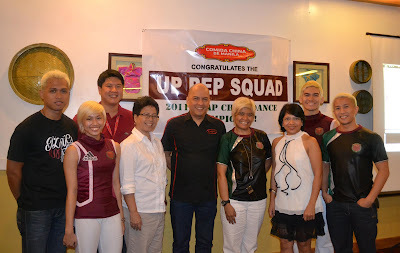 At the same competition, the UP Pep Squad took home all the other awards to be won : the first crown of the inaugural Samsung Group Stunts Competition and the Samsung Stunner of the Day title, care of “blonde” looker Nezsa Salvador. National Basketball Association legend, Clyde Drexler, is in the country to take part in NBA Madness Philippines 2011 which is presented by Petron and jointly organized by NBA and Solar Entertainment. This is one invite I couldn't resist, meet and greet with Clyde 'the Glide' at Palladium, New World Hotel. This is Drexler's first time to visit the Philippines and he said he was happy to see our country. He added "despite the bad weather, the Filipinos are very warm and friendly". He gamely answered questions thrown by the media. This man has got a good sense of humor. Orlando Magic Dancers and Portland Trailblazers Dancers performed one of their dance acts. They also answered few questions from the media. NBA Madness is a free fan event featuring basketball clinics and games, including the Clyde Drexler Challenge, in which fans can compete against the NBA legend for prizes. Drexler will give fans a unique insider perspective as he provides live commentary at viewing parties showing some of the NBA's greatest games. The event will also feature dance team performances, Asia Miles Dance Clinics, autograph sessions, and a video game corner featuring the newest NBA video game, NBA2K12. Fans can take part in the excitement of NBA Madness Philippines 2011 on October 1at the SM Southmall and October 2 at the SM Mall of Asia Music Hall. In addition to the mall events, the first-ever NBA Madness Team Spirit School Tour will bring Orlando Magic Dancers and Portland Trailblazers Dancers to five schools in Manila to conduct free dance clinics for campus dance teams from September 28 to September 30. As part of NBA Cares, the NBA and the SM Foundation will also partner to conduct a Read To Achieve read and play session for 100 underprivileged kids from all over Metro Manila on September 29 at the Skydome at SM City North EDSA. Drexler and the dancers will also make a stop at the Finals of the Coors Light NBA Pop-A-Shot Tour 2011, which takes places on September 29 at the Metrowalk in Pasig City. Curves Lends Support to Sagip Buhay Medical Foundation Inc.
Curves Bonifacio Global City has pledged to lend its support to Sagip Buhay Medical Foundation Inc. in an effort to raise funds to support its programmes specially in helping women battling breast cancer. Curves waives joining fee in partnership with Sagip Buhay Medical Foundation Inc. for Breast Cancer Awareness. Curves is a facility especially designed for women featuring a complete 30-minute cardio and strength-training program that has been proven to be clinically effective with a positive effect on body composition, metabolism, and resting heart rate. Curves appeals to women of all ages who want a fitness routine that differs from typical gyms, struggle with their weight and fitness, find attending traditional gyms very intimidating, or due to cultural beliefs find exercising in a mixed environment impossible. Founders Gary and Diane Heavin are considered the innovators of the express fitness phenomenon that has made exercise available to millions of women globally, many of whom are in the gym for the first time. With our busy lives full of work and other occasions, it can sometimes feel like we need to make grand gestures to let our kids know they're loved. In reality, parents don't need to spend a lot of money. Remember, "it's not the activities, but the energy behind the activities that makes a child feel loved", says Doris Jeanette, a licensed psychologist in Philadelphia. Often times, making your child feel loved is as simple as paying attention. Kids love it when mom or dad hug them, play with them, walk hand in hand, and even sincerely looking at how they draw or paint makes them feel loved. The amount of attention and love you give your child will bear fruit in the end. The children will grow up smarter, more confident, kind and cheerful. It's no wonder why kids love Barney. Barney means play. Kids feel so much love when parents take time to play with them. The owner, Andrew Masigan, studied at Japan’s exclusive Sophia University, famous for educating such greats as Morihiro Hosokawa, Japan’s 79th Prime Minister; the late Hisashi Inoue, award-winning playwright and author; and George Takei of Star Trek fame, to have its patrons leave happy, contented, fulfilled and blissfully sated. Raku has variations of the four basic ramen flavors: Shoyu (soy-based), Shio (salt), Tonkatsu (pork broth) and, of course, miso. Served with characteristic Japanese minimalism on beautiful pottery imported straight from the inscrutable country, Raku is easily an authority on Japanese noodle preparation. However, it is worthy to note that you will be surprised – the different noodle dishes bring consumers to a unique noodle experience. Executed flawlessly by the owner’s nephew and Executive Chef CK Kalaw, who trained at Le Cordon Bleu in Australia, Raku’s noodles have a playful and distinct touch while still maintaining the soothing and familiar flavors.The incorporation of miso in the soup gives the broth a fuller, earthier flavor, in addition to certain nutritional values thanks to its high levels of vitamins and minerals. The GYOZA. There is an underlying light-heartedness to the gyoza, from the fused variations to the more classic types. Take for instance the scallop gyoza, which imports its ingredients straight from Japan. Although the first bite is typical, the true flavors abound once you swallow, releasing memories of woodcuts, mountains and chilly peaceful lake. Raku’s gyoza is just as light-hearted as the ramen. The gyoza festival at Raku brings in cheerful gratification with its innumerable choices all revolving around basic flavors of pork, chicken, shrimp, scallop and salmon. What's best? Raku is on buy 1 take 1 all food items from 2pm to 6pm and 9pm to 11pm daily. Certain guidelines to be followed: The promo is not applicable for beverages. Not applicable for other discounts and senior citizen discount. 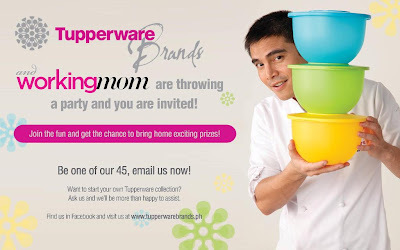 For delivery and take out, add P20 per order for microwavable packaging. Vat excluded. 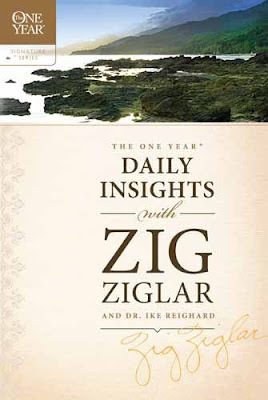 Zig Ziglar is a popular motivational speaker. He is well-known authority on complete and balanced success. Zig Ziglar has spoken on the same stage as Presidents Ford, Reagan, Bush, General Norman Schwarzkopf, Secretary of State Colin Powell, Dr. Norman Vincent Peale, and Paul Harvey. Now, for the first time ever, Ziglar has gathered his insights on what the Bible says about life. This book is perfect for those who long to create a positive and achievement-oriented outlook on life. 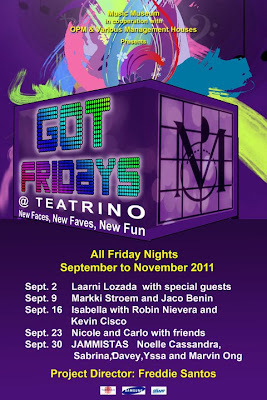 It will be fun, fun, fun Fridays all Friday nights of September all the way to November 2011 at Teatrino, Promenade in Greenhills. 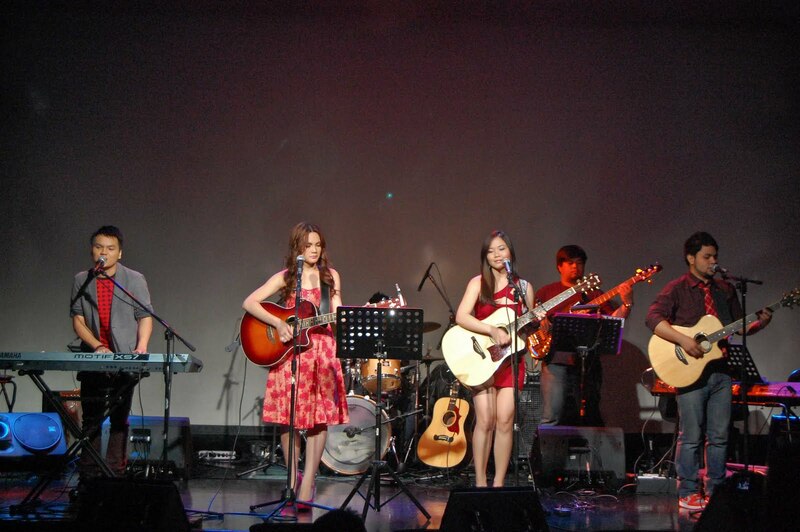 Got Fridays @ Teatrino will showcase the latest generation of local singers in a smorgasbord of musical sets, providing nearly three hours of wonderful new sounds and performances from September 2 to November 25, 2011. 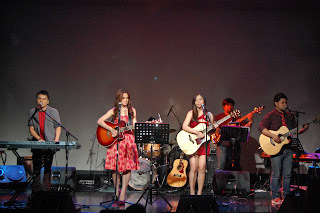 Directed and conceptualized by Freddie Santos, one of the most notable stage directors in the country, this innovative musical presentation “brings young, up and coming artists who have already been launched or who have had their first CD albums released up to the next level of their musical careers.” The musical project is a collaboration between Music Museum Group Inc. and various artist management houses. 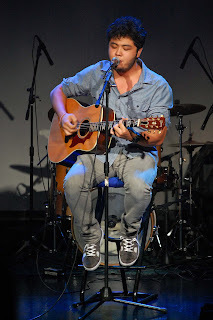 It will feature fresh local artists who already have their rabid fan following and second generation musical talents that are “chips off the old block”. On tap this September are new artists : Grand Star Dreamer Laarni Lozada, pop classical balladeer Markki Stroem,Fil-Italian heartthrob Kevin Cisco, newest band sensation 3AM, teen acoustic pop duo Krissy and Ericka and the Jammistas – outstanding singer-musicians that Viva Records fused into an even more outstanding musical group (composed of Yssa Alvarez, Sabrina, Davey Langit, Noelle Cassandra and Marvin Ong). 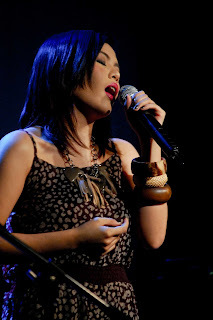 Then there are the next-gen singing sensations : Nicole and Carlo David, children of jazz great Mon David; Isabella (Kuh Ledesma’s “little girl”), Robin Nievera, son of concert royalty Martin Nievera and Pops Fernandez and Jaco Benin, son of Side A’s Joey Benin, who will perform with Markki Stroem. 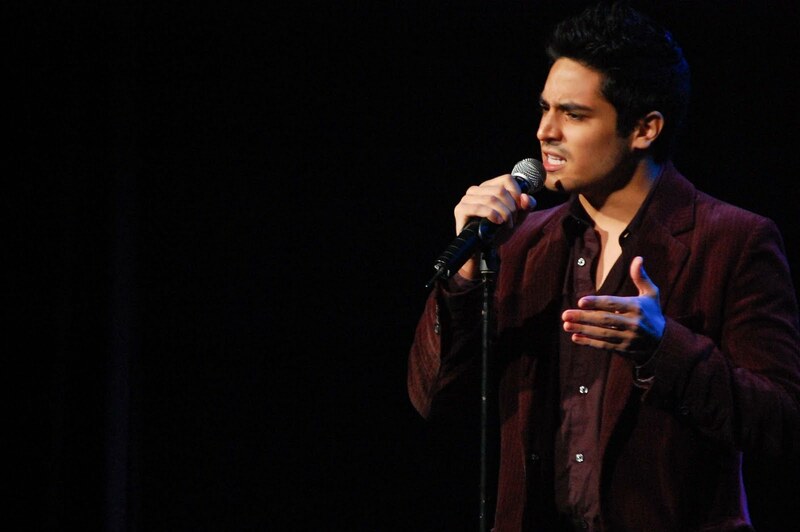 These young artists headline September Fridays from September 2, 9, 16, 23 and 30. Many more are on tap for October and November. 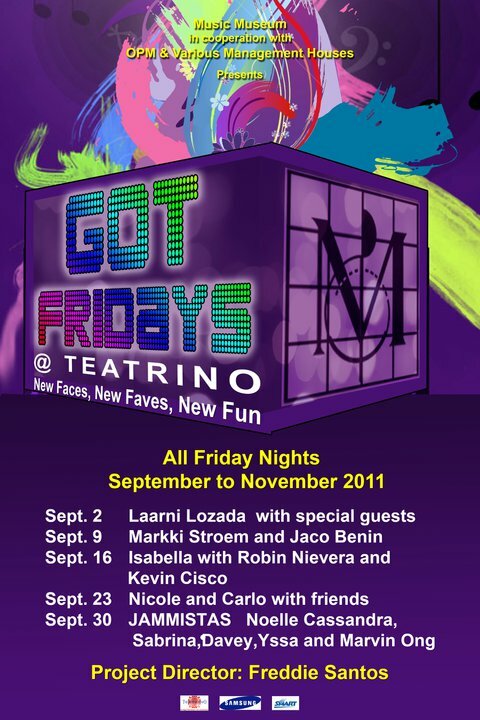 Got Fridays @ Teatrino isn’t only unique because of its new show concept, it will also tickle the taste buds with a fun menu available only on Fridays at the Teatrino : casual, funky food (pop corn, onion rings, barbecue and such) to munch on with light drinks at very affordable prices. Tickets to this new Friday night diversion are at P500 each. For ticket reservations, call 7228310 loc. 116 for a great night out with friends, family, barkada and weekend buddies. Got Fridays @ Teatrino will surely satisfy cravings for good music, good food and a novel experience that’s easy on the pocket as well. 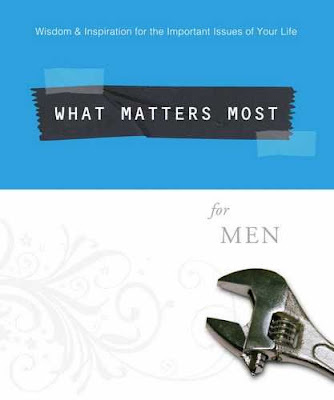 What Matters Most for Men tackles fifty of the crucial life issues, such as, making difficult decisions, trusting God for your future, guarding your soul against temptation, sorting out priorities, glorifying God with your work, relating with others and many more. This is a devotional book that addresses crucial life issues and reveals what is important in life.Each book weaves together reflection questions, real life stories, brief-but-hard-hitting Bible studies, life application ideas, and prayer starters that spur the reader towards authentic growth. 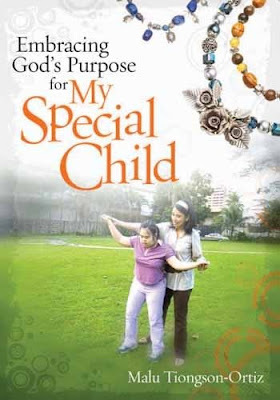 The author, Malu Ortiz, shares her journey as she learn to embrace God's purpose not just for her Down syndrome daughter Clarissa, but to her and their whole family as well. Malu shares many practical advice and qouted useful resources in each chapter. The book is filled with with testimonies from other parents of special children, on how they embraced, coped and lovingly accepted their special child. lost count as to how many I've done so far. But one of the best experiences I had was when I gave a talk to the parents of special children. There is just something special with the love the parents have for "their special gift" from God. But this kind of parenting journey is littered with a lot of triumphs and tragedies along the way. Malu's book digs deep into the heart. She articulates her feelings and experiences so well it is a must read for all parents. 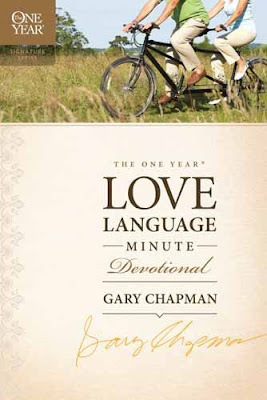 This book warms the heart." Having twin kids runs in my family, both in my husband's side and mine. John has twin male cousins. I have twin male nephews via my cousin, Ate Chel. Just 3 weeks in conception, the doctor told us we were having twins. John and I were elated. It took us 9 years to have a baby. In 2005, I got pregnant (unplanned) with Juan. We were hoping to have twins again, then I will opt for ligation, but then we only have one baby (that's why we called him Juan). Last summer, while buying donuts at SM Makati, Juan kept tugging on my shirt, saying, "Mom, look at the boy outside, he looks just like me". I didn't mind him at all because Juancho tends to be too 'makulit' at times. When Julia (our ever soft-spoken, well-mannered daughter) came near me and whispered, "Mom, look outside. The boy looks like Juan Juan". I looked outside and saw Juan's twin brother from another mother. I asked the boy's mother if I could take a photo of them together. When I pointed Juan to the Mom, she gushed and said, "oo nga, parang kambal sila!". Turns out, the boy (forgot his name) is Japanese, born and raised in Japan. 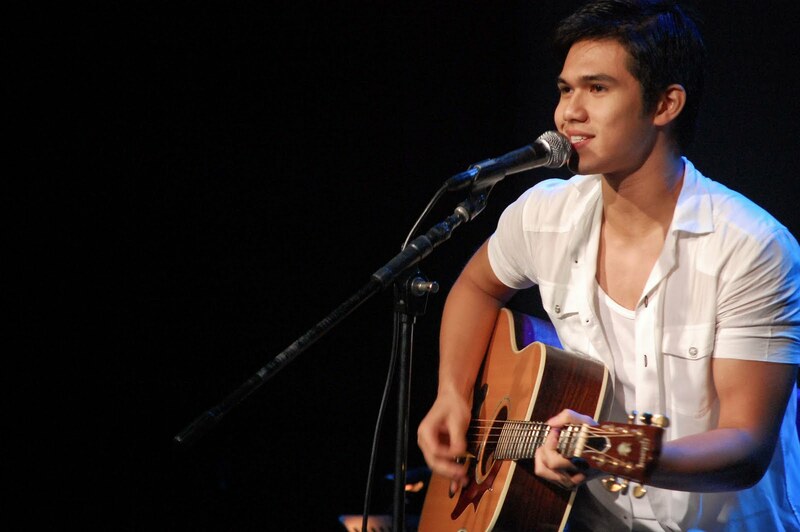 Was only in the Philippines to visit his Filipina Mom's family and relatives. I used to run when I was in elementary and high school during sports festivals. That explains my big logs, err...legs. I had to stop in college to concentrate both in school and work. After giving birth to my twins in 2002 I gained a whooping 62 lbs. Then I gave birth again in 2006, which added an additional 10lbs. I thought of running again but the lack of motivation kept me from doing so. Until I came across this mini but might magazine, The Bull Runner, in 2009. TBR features reliable running techniques, arrays of running gears and gadgets that is helpful to newbie and old-time runners alike. Although I only joined race/run this year, I am confident I gained enough knowledge from reading TBR. It is also great that TBR features popular people's running stories (like my favorite Drew above). It motivates an ordinary mom like me to run farther and better. A little trivia: TBR was created by a mom (yes, like me!). 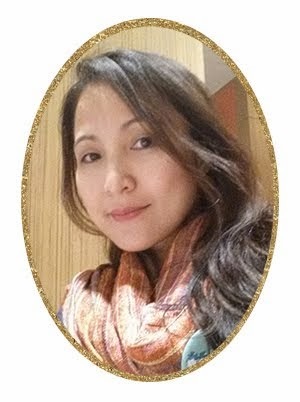 Jaymie started her blog in 2007 to share her passion for running. Since then, www.thebullrunner.com has received thousands of hits and bagged two awards at the 2008 Philippine Blog Awards. The Bull Runner is a FREE quarterly magazine that you can get from Runnr (Bonifacio High Street), Second Wind Running Store, selected Mizuno outlets, selected Toby's outlets, R.O.X. (Bonifacio High Street), all Starbucks branches, Paul Calvin's Deli, Mizuno Run Clinic, Moro Lorenzo Sports Center, Miguel del Prado.